The majestic elk is spread across the mountains and forests of North America from Arizona to British Columbia. With adult elk weighing 500 to 700 lbs, one elk supplies several hundred pounds of delicious venison. From the American Indians and early settlers to modern-day hunters, elk meat supplies a lean source of protein. While hunters actively pursue elk for their trophy antlers and tender venison, you can also purchase elk meat from various elk farms. One of the best pieces of elk venison is the backstrap -- a long muscle located next to the spine that is characterized as a lean, tender piece of meat, ideal for steaks. Trim any fat from the elk backstrap and pat dry with a paper towel. 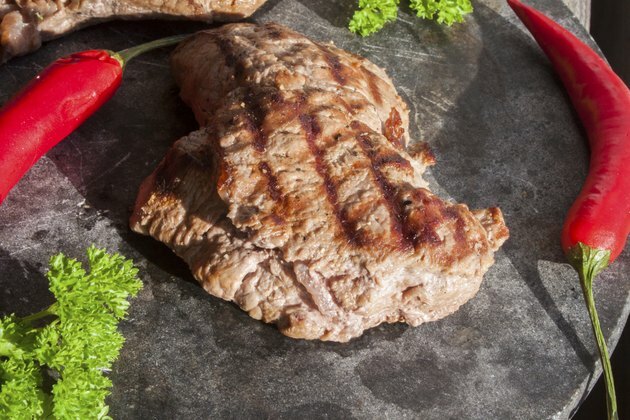 Slice the elk backstrap into 1/2-inch steaks for grilling or 1/2-inch cubes for sautéing in the skillet. Rub the meat with olive oil, sea salt and ground black pepper. Preheat the grill to "high." Place the elk backstrap steaks on the grill, turning with tongs after four to five minutes. Remove the steaks when they reach an internal temperature of 110 degrees Fahrenheit. Allow the venison backstrap steaks to "rest" for 10 minutes before serving. This allows the natural juices to return to the middle of the meat. Slice the steaks across the grain. Preheat the skillet to medium-high heat. Melt the butter and add the garlic and elk backstrap cubes. Cook for about 10 minutes, turning occasionally. Remove the elk backstrap and place on a paper towel to rest for five minutes before consuming. Cook the elk backstrap and other tender cuts of venison using a hot fire and a short cooking time. Never overcook elk backstrap as it can turn dry and tough.